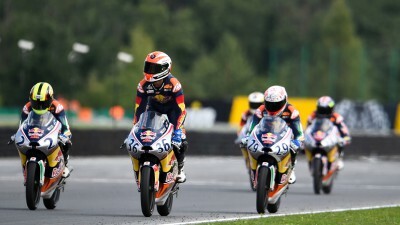 Silverstone will be just as tough as Brno for the teenagers of the Red Bull MotoGP Rookies Cup. The British Grand Prix venue is similar to the Czech circuit in that it is wide and open with a variety of corners offering a huge choice of lines so it takes some learning to make the best of it. Of course the old airfield is far flatter than Brno but it is likely to repeat the unpredictable weather that was a major factor in this year's Grand Prix of the Czech Republic. Varied track conditions make it hard for the circuit newcomers to learn the circuit but in Brno, Fabio Di Giannantonio, Marc Garcia, Enzo Boulom and Bo Bendsneyder made a nonsense of that by all being in the heart of the battle for the lead through Race 2. So looking forward to this weekend it is obvious that any of the first year Rookies could be challenging for the win as they did in Brno. Of course the men to beat are also the same; points leader Jorge Martín, the 16-year-old Spaniard who had his points advantage cut by a last lap crash in Brno when nearest rival and fellow countryman Joan Mir, also 16, won and slashed his lead to just 30 with five races remaining. Mir was second last year in Race 2 at Silverstone. There are still 125 points to be won so the battle is far from over and Stefano Manzi has now moved into third place in the table, the 15-year-old Italian displaced 15-year-old Japanese Soushi Mihara who had a torrid weekend in Brno. While Mihara suffered a 7th and 13th, Manzi picked up two thirds. As Manzi pointed out in his blog this week, "I have not bought an apartment on the third step of the podium, I intend to change but remain in the same building!" He is still looking for his first win and every weekend seems to cross the line in the lead at any time other than on the last lap. He was a step luckier than Brad Ray though as the 17-year-old Briton was twice fourth in Brno after also having his chance in front. The home crowd advantage may be all Ray needs to take his second Rookies Cup victory, he was first in Austin's opening race last year. Certainly don't count out Manuel Pagliani, the 18-year-old Italian has had three crashes in the last four races, one was not his fault and when he didn't fall he was second in Race 1 in Brno but on the other two occasions he fell while leading. After falling on the first lap in Brno he was furious with himself. “I just wanted to race away from pole, I was pushing, I made a mistake. I could say 'next time' but I am tired of saying, 'next time'.” He has been second three time this year, he won a single race last season yet he often looks the fastest of the field. He stands sixth in the points behind Brad Ray. There are other class riders to look out for, 17-year-old Turk Toprak Razgatlıoğlu, the hero of Germany and Olly Simpson, the 16-year-old Australian who must at least podium before the end of the year. These are all class riders, in fact there are no fools in Rookies Cup.